The international diamond industry is failing to enforce measures to curb the trade in so-called "conflict diamonds", according to a London-based watchdog. 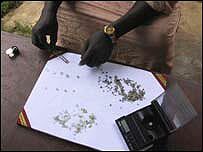 The report by the Global Witness group says the diamond trade still fuels armed conflicts, mostly in Africa. The group said its findings were based on research done in the US, where over half the world's diamonds are sold. A US diamond retailers' spokesman told the BBC current curbs were effective and the report's claims were "rubbish". Matthew Runci, from Jewelers of America association and the World Diamond Council, said the report was based on "anecdotal impressions" and US diamond dealers complied with international requirements. The Global Witness report said most of the American diamond retailers it had surveyed failed to show they had clear checks against the sale of diamonds that may have financed conflicts. A system of self-regulation, known as the Kimberley Protocol, is currently in place. But Global Witness has argued that governments which have signed up to the agreement should abandon self-regulation and directly regulate the diamond trade. Conflict diamonds, also known as "blood diamonds", have been linked to armed struggles in Sierra Leone, Liberia, Democratic Republic of Congo and the Central African Republic. Investigators have also alleged that underground militant organisations such as al-Qaeda have used the diamond trade to transfer finances outside the gaze of the international banking system.